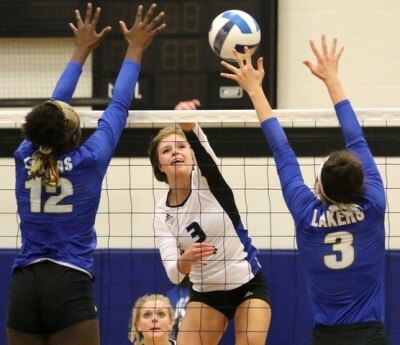 There's a lot to like about the Kirkwood women's volleyball team so far this season. The Eagles have a sparkling 22-4 record, they've knocked off five ranked teams and they're sporting a No. 12 national ranking themselves. They might not win the ICCAC Conference title this season as a result of two losses to ranked opponents, but they're putting themselves in a good position to challenge for a spot in the NJCAA Division II national tournament in November. Kirkwood rolled by Iowa Lakes, 25-14, 25-16, 25-13, in a conference match at Johnson Hall Wednesday night for its 12th victory in their last 13 contests. The only loss during that streak was a five-set defeat to 11th-ranked Hawkeye Community College in an ICCAC match last week. 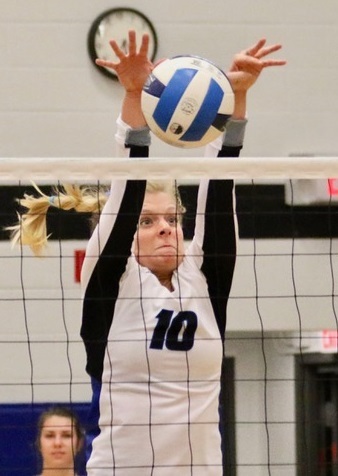 "It was important to bounce back in a conference match and advance our level of play," Kirkwood Coach Jill Williams said Wednesday. "It sets us up for another weekend with top-notch tournament. "I felt better about how we recovered from our loss," she said. "It was good to be in Johnson Hall and relaxed. We had good energy." The Eagles will face top-ranked Johnson County Community College and three other teams in the DMACC tournament this Friday and Saturday. The Eagles have made a habit of facing strong opponents in weekend tournaments and this will be more of the same. In addition to losing to 11th-ranked Hawkeye, the Eagles also have lost to 19th-ranked DMACC in a conference match. That leaves them with a 4-2 record in the ICCAC, a full two games behind 10th-ranked Iowa Central (6-0) with only three matches left in the regular season, including a showdown at Iowa Central next Wednesday. Kirkwood still has a chance to win the conference title and the No. 1 seed for the postseason tournament, but Williams is not obsessed with being the top seed for the tournament. The Eagles have succeeded as a No. 1 seed and they've fallen short as a top seed in recent years, so Williams knows it's not the most important ingredient for success. "Let's just be the best team we can be at the end of the year," she said. "Let the pieces fall into place. If we're playing our best volleyball, we'll be okay. "When this team is playing our best, I consider us a 1 seed. We'll take whatever comes at us." Alexa Aldrich-Ingram, who ranks fifth in the country in kills, collected 10 more Wednesday and has 363 for the season. Lauren Keane, who ranks ninth in assists, dished out 24 and has 334 for the year. Sami Johnson had eight kills, Maddie Huff seven and Haleigh Durnin five. Maddie Lavenz contributed 13 digs, Durnin 11, Aldrich-Ingram seven and Keane seven. Johnson blocked four shots. Iowa Lakes, featuring 10 players from Texas, fell to 7-21 overall and 1-5 in the conference.